We are gong to do 4 coats of plaster on our build the first being the reveal coat / slip coat / key coat. 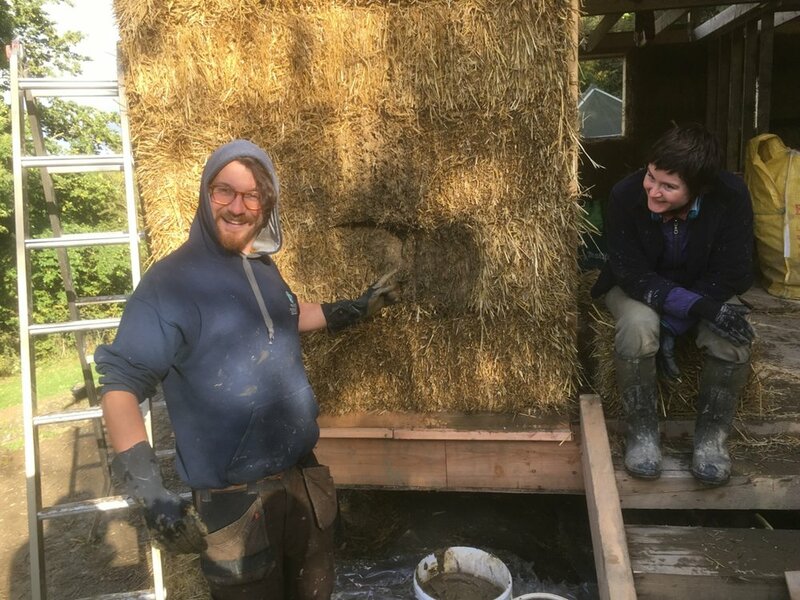 The reveal coat is a very wet thin slip coat, who’s job is to give a good key for the following coats and reveal any gaps etc that need more straw. The reveal coat is put on by hand (mainly the finger tips). It’s very important to get your fingers into the straw as deep as possible. Working the slip (clay and water mix) into the bales. If your just brushing the surfaces, your not building a good key, the deeper it is the better key it will be. Imagine fingers interlocking, if its just the tips you don’t have much grip and they can come apart easily if pulled. If your fingers interlock further and you try to pull apart your notice it’s harder. Massaging the slip into the bales, any holes / gap that are discovered ‘reveal’ them and make them obvious, this will help in a moment. Work a lot of slip into these holes and crevasses. One thing I learn it it’s a lot quicker overall to work slower and better at the reveal coat, than it is to rush the reveal coat and have to patch it later on! 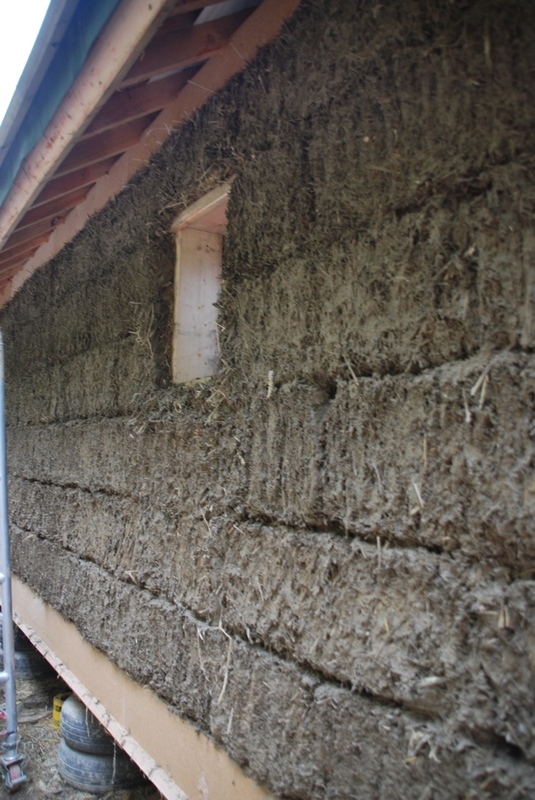 Once the reveal coat is on you can see the contours of the bales, and most likely the joins between bales. 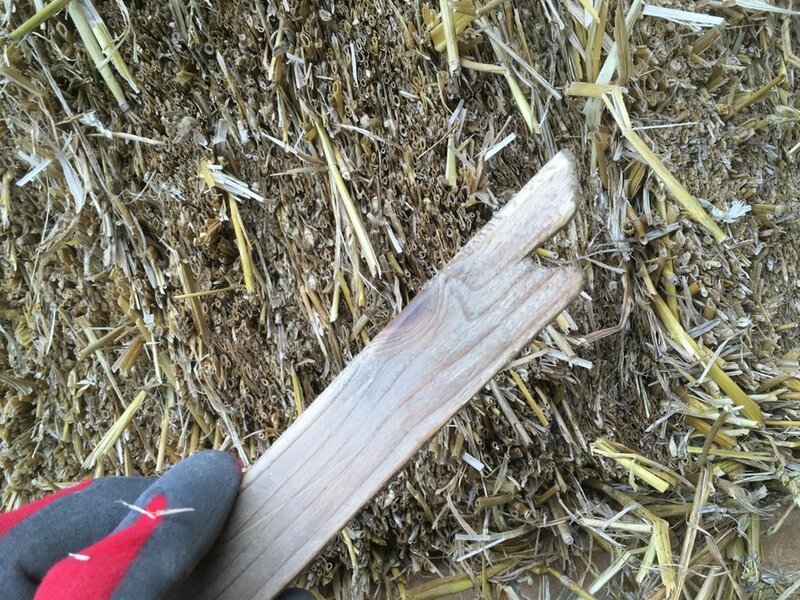 Where you have deep holes / gaps, these should be ’stuffed’ with dry straw (better insulation). See below picture, after reveal coat, dry straw stuffing, and 'stuffer' as mentioned in previous post. After the reveal coat but before the matrix coat comes the dubbing out. Dubbing is made from clay straw, it’s more like dirty straw than it is a plastering wet mix (see picture below). It’s hard to give quantities as its more a feel / knowing. If you’re unsure, its best to book onto a short clay-plastering course, or have an expert leading the build if self building. The Dubbing is then pressed into the shallow gaps between bales to get a uniform-ish surface. The dubbing need to be arranged into a birds nest with all the straws criss-crossing to help add strength. If you’ve ever had tangled hair your understand the principle. If your hair / straw is nice and smooth and all lines up. It’s easy to get a comb through and comes apart easily, if your hair / straw is all miss matched like a birds nest, its harder to comb and wants to stick together… Great for plastering, not as desirable in hair… With your bird nest dubbing mix, make sure your really poking it in with your fingertips and twisting it, this is going to make it into a beautiful interwoven strong straw clay plaster. Once the dubbing out is done the whole surface should be uniform. Please see below before and after pictures. Notice the slip / key coat on the wood-fibre board at the bottom. Don’t worry if you haven’t got your dubbing in deep enough or twisted enough… Your soon find out when the dubbing mix starts dropping of your wall! This is a great example of when it’s faster overall to work slower and melodically through each stage.